Sticky, bright colorful swirls of pure pleasure that are deliciously fun to eat. Jalebi traditionally originates from the suks of the middle east and it's easy to see why it has become one of our most popular sweets. They're so sweet and sticky that you just can't leave them alone. The mixture of plain flour gram flour and urad (lentil) flour is mixed with water and then deep fried in pure ghee (butteroil) giving it a distinctive texture. And the stickiness? 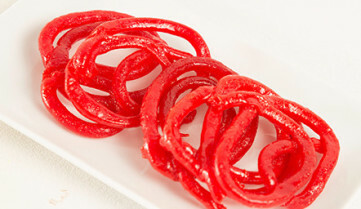 That's from the lashings of syrup that makes every Jalebi so deliciously sweet. A true classic among Asian sweets and worth a place on anybody's dinner table.